To study LNG powered freight market on the Mediterranean Corridor (Barcelona-Ljubljana) through innovative approaches & technologies in order to allow quick deployment of Natural gas as alternative clean fuel in a smart and economical way. Additionally, the action also aims to study the implementation of LNG refuelling point in the Port of Barcelona as one key core node in the exchange of goods (starting and ending point for road freight transport). Deployment of 3 L-CNG refuelling stations in 3 strategic points across the Mediterranean Corridor. 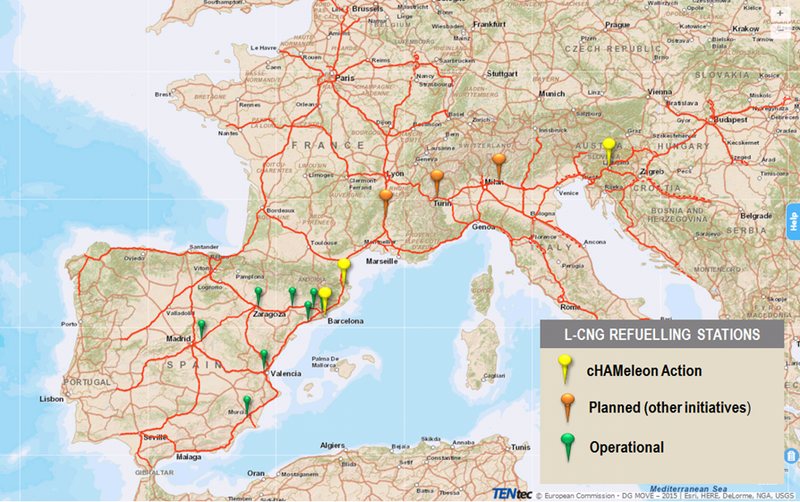 Perform a real-life trial study using 3 (+3) L-CNG refuelling stations located at 6 strategic points of Mediterranean corridor. Elaborate a deployment plan, appropriate business models and overall recommendations for the roll out of a full network along the Mediterranean corridor.